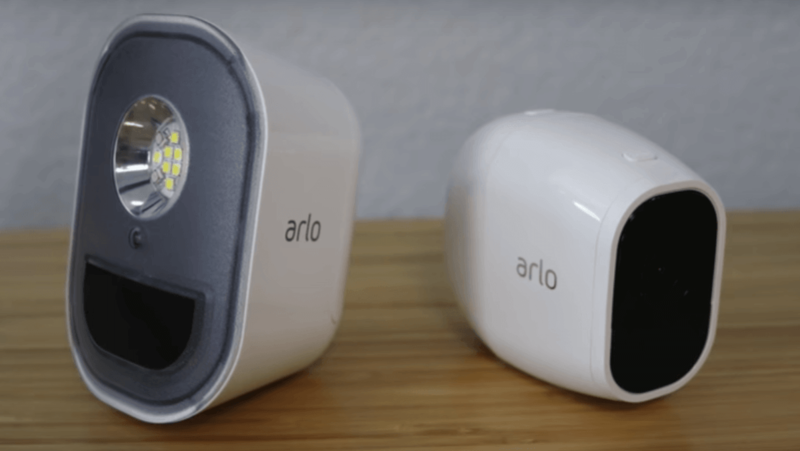 Arlo Security Light Review: 5 months later, are its smarts worth the high price? Security cameras can be terrible seeing things at night. 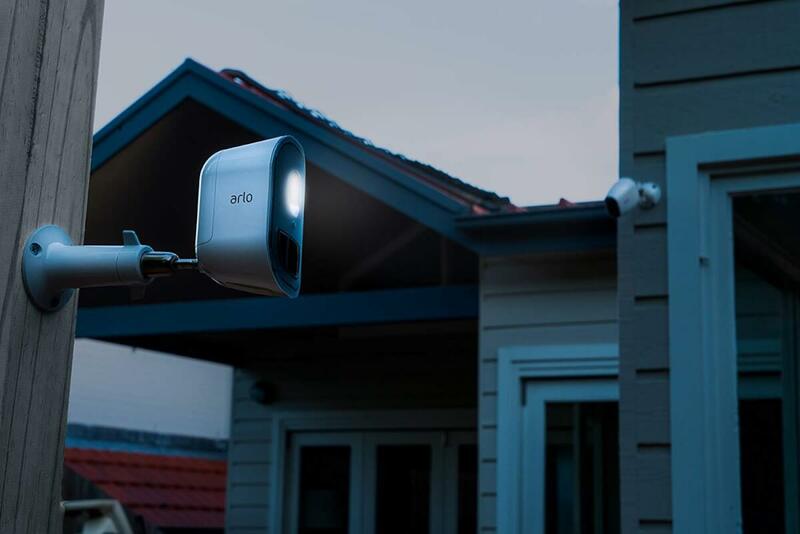 Arlo Security Light looks to solve that problem by triggering your cameras earlier, while also illuminating the whole area. In this Arlo Security Light Review, we tested the light hands-on for several months. Find out how Arlo Light’s battery life held up, and whether or not it’s worth the high price. Read on for more details beyond what we cover in the video above. 1.7 Is Arlo Light worth it? Affiliate Disclosure: This page has affiliate links, which earn us commission at no cost to you. The writers of this blog received a free sample of Arlo Light and security cameras for review. They were not compensated in any other way. The opinions are 100% their own and not influenced. Just like all Arlo devices, the Arlo Security Light is well-built, high quality, and works without major problems. You can expect the light to reliably illuminate the area around your home, while adding smart home functionality that makes your life easier. The light is 400 lumens. While it’s not as bright as your typical floodlight (which can range from 700-1500 lumens), it adds enough to illuminate the area and make it easy to see. One additional benefit is that the Arlo Security Light makes your security camera footage much brighter and easier to see. We tested some Arlo footage at night in our backyard, with and without the security light installed. 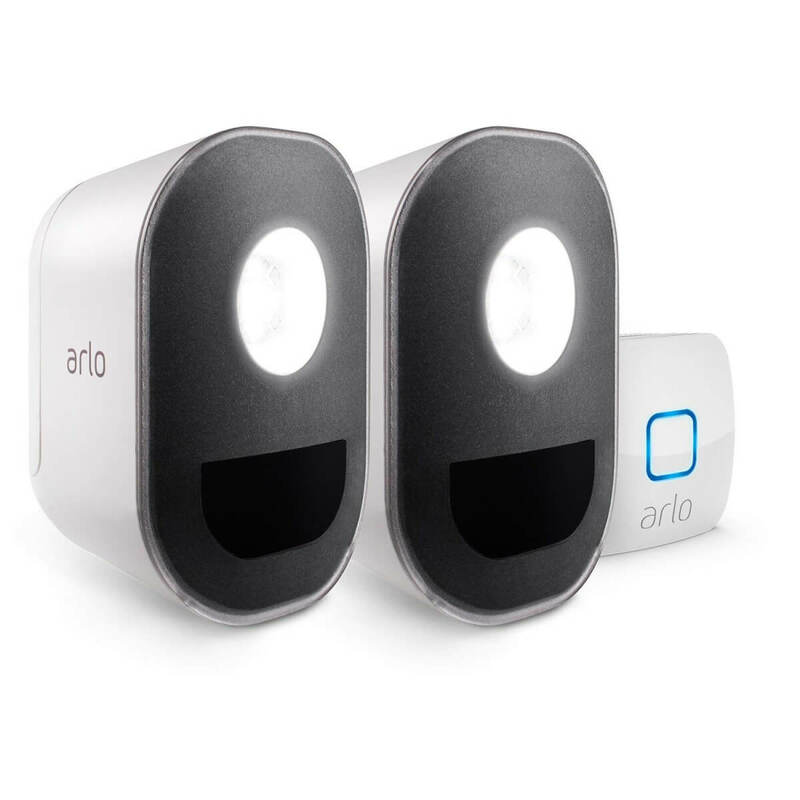 It was impressive how much of a difference the Arlo Light made in distinguishing faces. 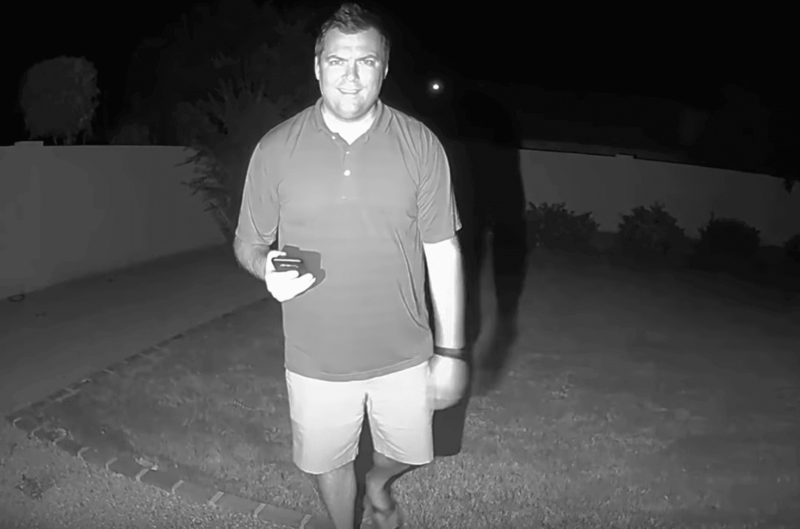 Unfortunately, the Arlo Pro 2 stayed in night vision mode even when we turned it off manually during testing for this Arlo Security Light review. This meant that our footage was always in black and white, unless we were very close to the camera. No magnet on the back. Unlike Arlo cameras, the light doesn’t have a magnet on the back for mounting to the magnetic base. Instead, you will have to screw in the included security mount to the wall with three screws, and then attach the light to the mount. This makes it a little more difficult to remove the battery for recharging. It’s also more of a commitment since you are using three screws instead of just one. Water resistant. The Arlo Security Light is IP65-certified. You can confidently install it inside or outside without worrying about water, wind, or snow damage. 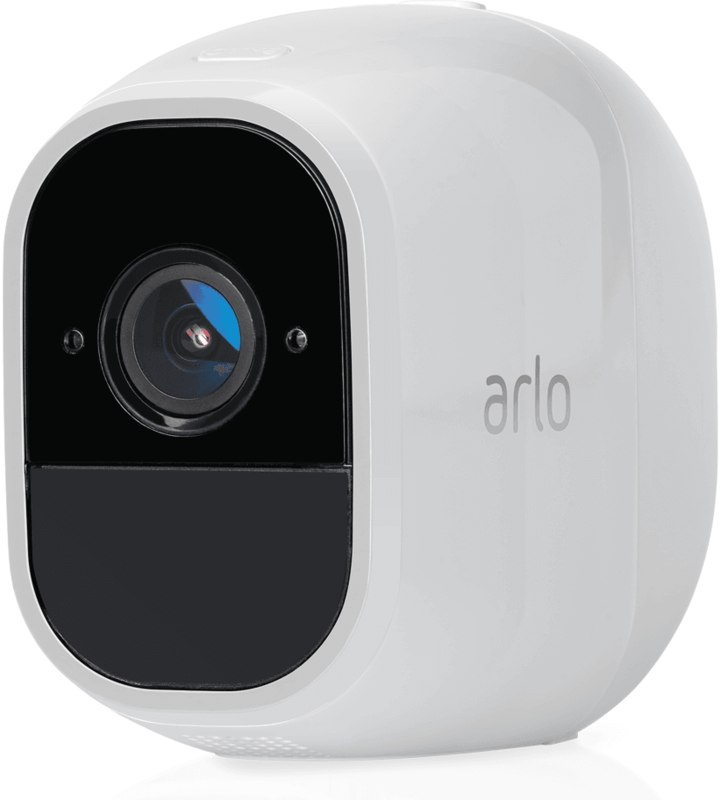 The Arlo Light looks similar to a traditional Arlo camera, with its white sides that have the logo on them. If the white isn’t your favorite, there are skins you can purchase on Amazon to help camouflage it. The face of the camera has the LED lights and the photoelectric and motion sensors. At 9.9 inches tall, it is small enough to hold in your hand. There is a sync button on top and screw hole on the back for installation. The battery is housed in the back, and you can easily slide off the cover to access it. On the bottom of the camera is a micro USB charging port, plus another small screw hole, though I’m unsure what you would use this for. The required bridge communicates with your lights to connect them with your internet. Note: this is separate from the Arlo camera’s base station. Even if you already have the security cameras and base station, you will still need the light’s bridge to connect your lights to the internet. 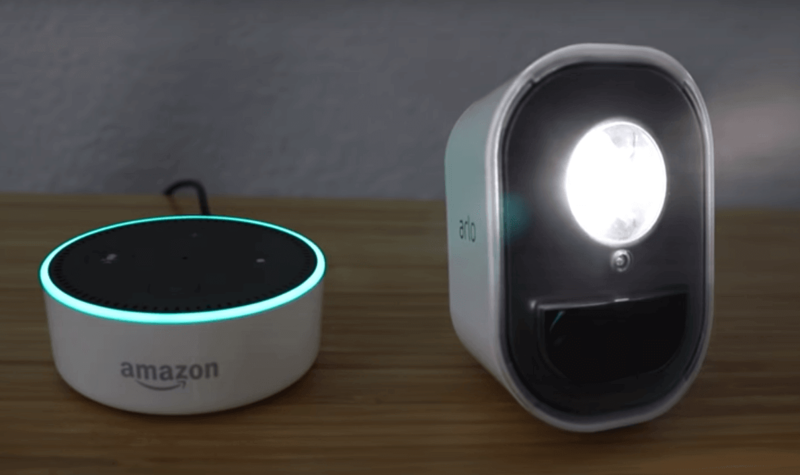 This also means that you can use the lights as a standalone device—you don’t have to own Arlo cameras for these lights to work. If you buy any Arlo light kit, it comes with the bridge in the box. Only the individual add-on lights are sold without the bridge. The bridge is basically a small square that plugs into a power outlet. Its color-changing status light lets you know if the bridge is booting, paired, or connected. It doesn’t need to physically connect to your router, so while it adds a bit of annoyance to have this plugged in, at least it can be separate from your router. It has a pretty strong range. In our testing for this Arlo Security Light review, the light worked 100 feet away from the bridge. It may be even stronger than that since we didn’t test its limits. In this helpful tutorial, Arlo gives some specific tips for optimizing the range, and shows how to test the range in the app. Just like the Arlo cameras, Arlo Security Light has a motion sensor to turn on the light when it senses motion. The sensor reacted as fast as Arlo cameras, and we suspect it may even be the same sensor on each. You will want to install the light somewhere that people walk back and forth. If someone is walking straight at the light, it has a bit of a delay in picking up their motion. This is easy to test during installation. As long as the camera is installed somewhere that most people would walk across its field of view, you will notice the light reacts much more quickly as you are installing the camera. The light’s motion sensor can also function as an external sensor for the security cameras. So if your light senses motion, it can turn on your light and trigger your cameras to begin recording immediately. You can also have the light trigger all other Arlo Security Lights around the perimeter to turn on as well. During the daytime, this feature also works, though it will only trigger the camera to record, and won’t turn on your lights. This is due to the photoelectric sensors that can tell if the sun is currently up. This helps reduce the problem of missing the first few seconds of footage as your camera “wakes up” in response to motion. 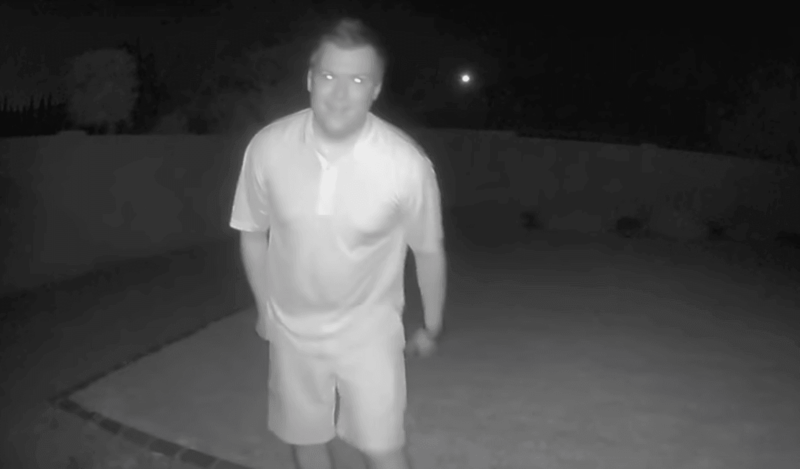 If your camera is on your front porch, you can put the security light somewhere on your driveway to trigger the camera to start recording before anyone even gets to your porch. The downside of this feature is that for every false alarm on the security light, you can expect recorded footage on your Arlo cameras. If you pay for the Arlo Smart subscription, the cameras come with person detection to ensure your cameras are only notifying you and recording when a person is in the frame, not just your neighborhood cat. Unfortunately, this technology isn’t available in the Arlo Security Light. While the light has adjustable motion sensitivity, turning it down too much results in it not responding well to someone walking straight at the light. When the sensitivity is turned up, for every tiny bit of motion in front of your light, you can expect it to trigger your camera to record. In our setup, this led to too many notifications and recording extra footage that we didn’t need. During our Arlo Security Light review we ended up turning off this functionality, but it could definitely be a useful feature for others. Arlo Security Light uses the same proprietary rechargeable batteries as the Arlo Pro and Arlo Pro 2. This is a big perk. If you own both, then you can rotate batteries between cameras and the light to always keep them powered on and charged. Arlo even sells a charging dock, so you can keep a battery on the dock and rotate it through your Arlo cameras and lights. The Arlo Light battery life is said to last four months for typical use. We have had ours installed for almost that long, and haven’t had to charge the battery even once. If you have more movement and use the battery more than average, it will likely drain more quickly and have a weaker battery life than that estimate. One of the conveniences of the Arlo Security Light working on a battery is that you can easily install it anywhere, 100% wire-free. This makes it easier to setup, take down, and move as needed. It’s also very flexible since you don’t have to place it next to a power outlet. Since it’s rechargeable, you also don’t have to worry about spending extra money replacing the batteries every few months. This makes way more sense than draining batteries (and your bank account) for no reason. 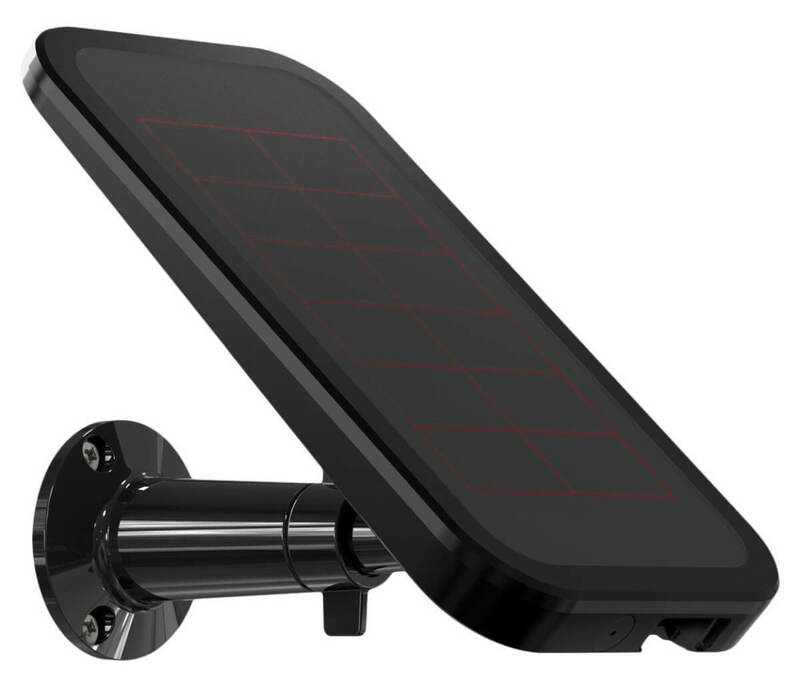 If you don’t want to deal with charging batteries at all, then look into keeping your light charged using Arlo’s solar panels. These are sold as an additional accessory for around $80. Just plug in the panel using the micro USB port. Install the panel next to the light using the included mounting kit. Then your light can stay charged indefinitely, and you’ll never have to think about charging batteries again. 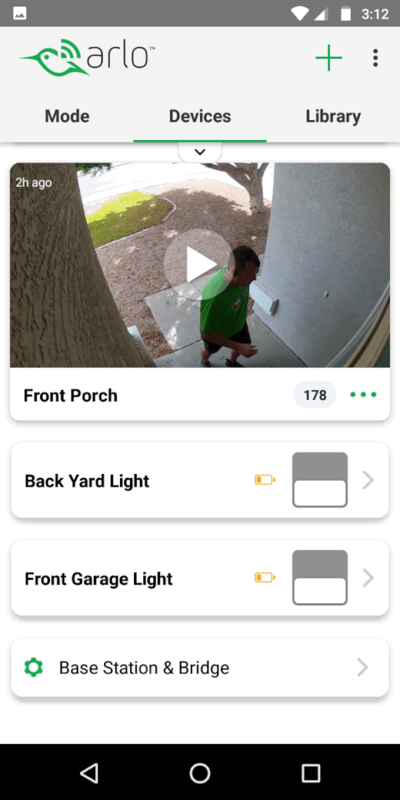 Just like the Arlo cameras, you can manage your Arlo Security Light anywhere (including away from home) using the app. Within the app is where you change alert settings to receive email or push notifications when your light detects motion. This is setup just like the cameras. You can edit the different modes (i.e. home, away, armed, etc) and have each mode trigger different responses to motion. Then you change modes within the app to arm or disarm your lights and cameras together. You can also schedule the modes to automatically activate and deactivate your light at the same time everyday, or use geofencing to automate them based on when you are home or away. If you have Arlo security cameras, you can only monitor up to five cameras on the free plan. However, Arlo Lights do not count towards this limit. You can add as many lights to your set up as you want without worrying about monthly subscription fees. The Arlo app is easy to use, reliable, and well-designed. 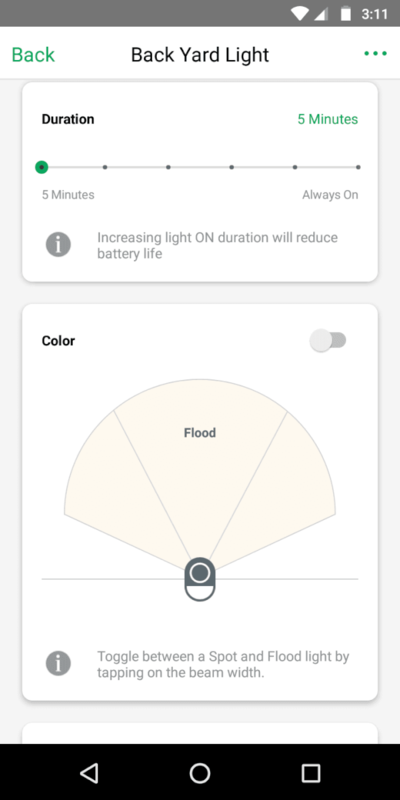 There are a few other settings on the light that you can control within the app, including the type of light, flashing, and colors. There are two types of lights with the Arlo Security Light: Flood and Spotlight. You can see the difference in our Arlo Security Light review video above. Flood is a wider, brighter light, while Spotlight is more narrow and slightly less bright. The brightness and width of the beam are also customizable within the app. You can also specify if you want the lights to flash in short or long intervals. Got more than one Arlo light? You can have them synchronize colors or flashing. Fancy. Choose between single or multi-color lights. When selecting a color, you can use a full color wheel to find the perfect shade that you want: there are more than 16 million hues to choose from. Arlo recommends changing the color of the light if there is danger or a situation to warn your neighbors about. For example, you can have the lights flash red if motion is detected. In our opinion, this seems like it would be more of a novelty (i.e. holiday lights) rather than a security feature. If you turn your lights red to tell your neighbors you’re out of town, then that could tip off burglars as well. Whether you use it for security or fun, it’s nice to have the color-changing feature on your Arlo lights. SmartThings coming soon? 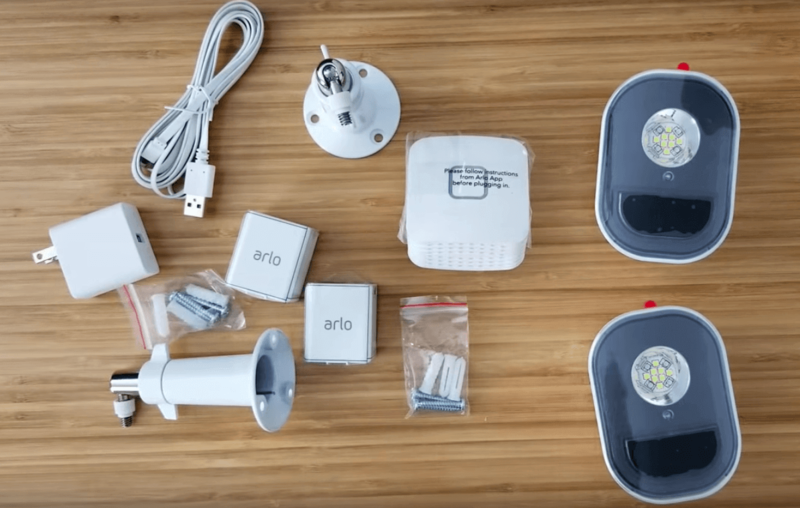 At the time of writing this Arlo Security Light review, the Arlo Light is not compatible with SmartThings, though it should be some time in the future. Alexa, turn on backyard light. Alexa, turn backyard light red. Alexa, set backyard light to 20%. Alexa, turn off backyard light. IFTTT integration. Automate your Arlo Security Light with other smart home tech, based on specific rules set up in the third-party app IFTTT (If This, Then That). 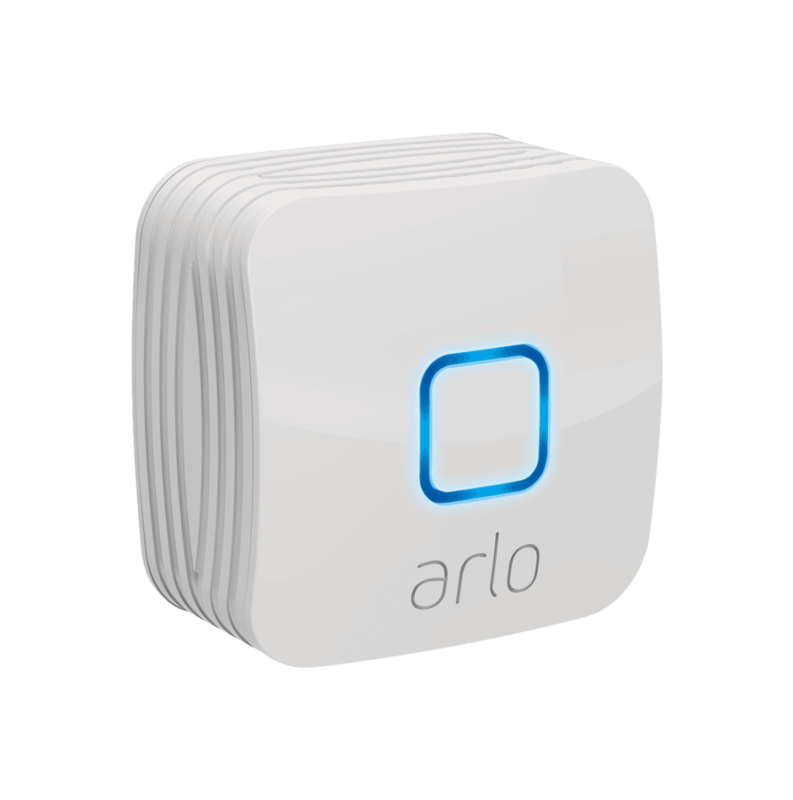 We go over a few ideas of integrating Arlo with IFTTT in this article. Is Arlo Light worth it? One question we’ve received on the video review we posted on YouTube is if Arlo Security Light is worth it. This is a valid question, since the light is priced around $120 per light. In other words, it’s not cheap. Now that I’ve completed my Arlo Security Light review and tested it hands-on, I think that this price is a little high for a single light. There are sometimes affordable options through Costco, as advertised on Arlo.com. While Arlo Light adds value and works with your smart home setup well, it is priced much higher than other smart lights or floodlights. This might be because it’s both connected and weatherproof, but it still feels expensive for a light that isn’t very bright. An alternative if you already have Arlo cameras is buying an additional Arlo Pro or Pro 2 camera, which costs around the same amount, and then adding a wireless floodlight for around $30. An external floodlight will be brighter, and the additional Arlo Pro gives you another camera for recording footage. If you use Arlo Smart, you can also turn on person detection so that the camera doesn’t constantly send you false alarms. 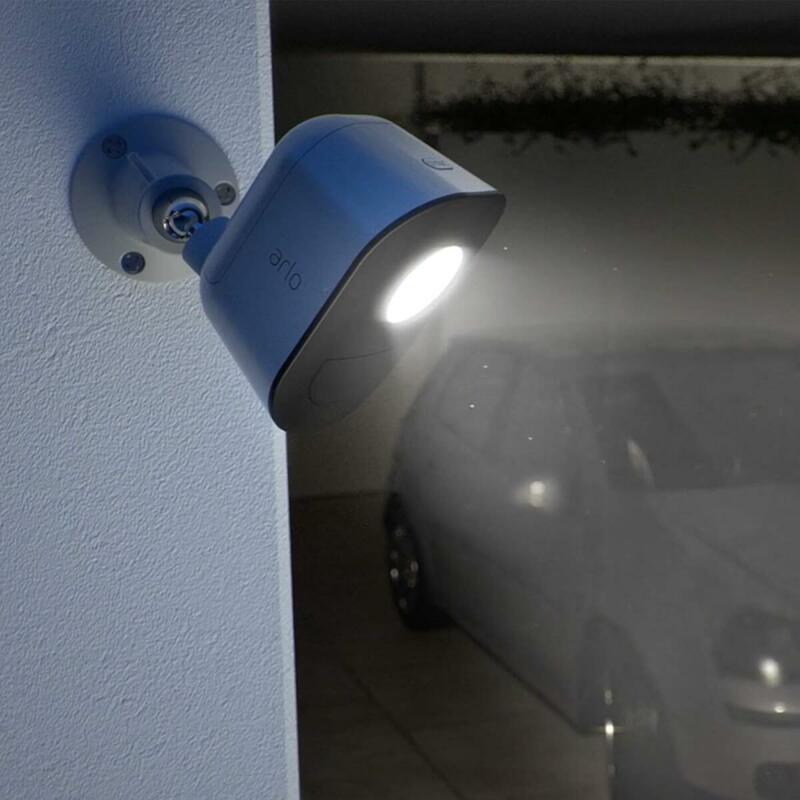 Now that you’ve read through our Arlo Security Light review, what do you think? Is it worth the high price tag, or would you rather skip this light altogether? 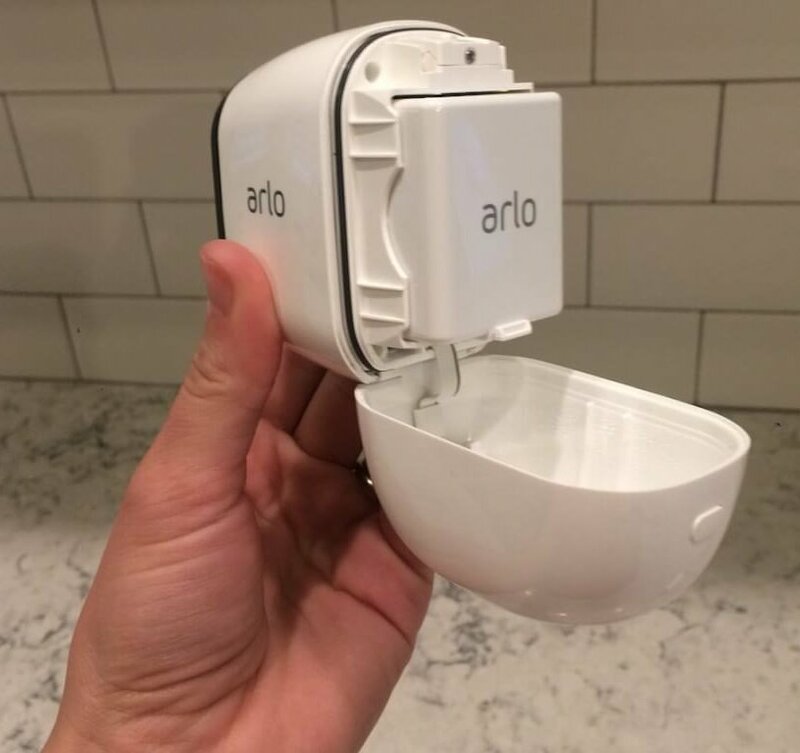 Comment below and let me know your experiences with the Arlo Light.